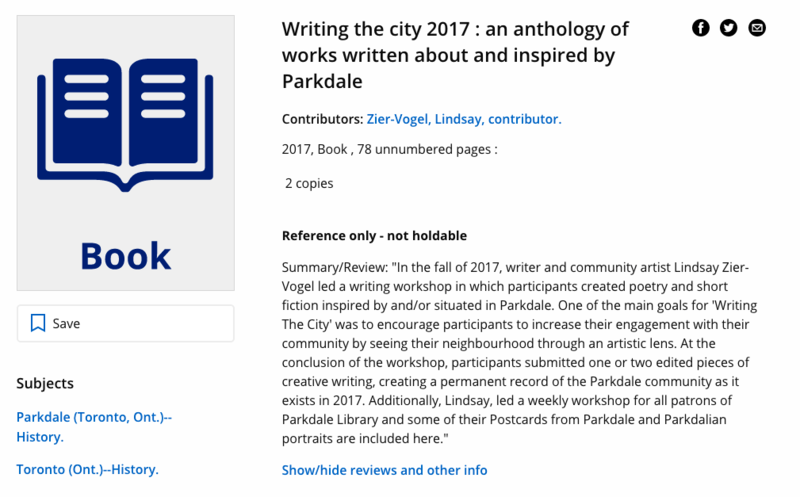 Writing The City 2017: A catalogued anthology!! | Writing The City 2017: A catalogued anthology!! In the fall of 2017, I worked with the most amazing writers at Parkdale Library. We met each week and wrote about our city, and Parkdale, sharing paragraphs and pages of our lives. It was a once in a lifetime group of people. Truly. AND, I just found out that our anthology, a collection of all of those weeks of writing is catalogued (AND SEARCHABLE!) in the Toronto Public Library database! So exciting! Check it out here!! Next time you’re in Parkdale, stop in and check it out! I am so grateful to the Ontario Arts Council for funding and Parkdale Library Toronto Public Library for support.